Anyone want to know how fast a fancy new Seadoo can go? I can tell you. It can go 110km/hr. Even with a screaming, terrified woman on the back, holding onto the guy driving tight enough to fuse their life jackets into one. Spent yesterday up in Killarney, Ontario. One of those places I knew existed, but never knew where. Or why. It was a spot on a map, a sign on the highway, a place referred to once in awhile by someone as I would nod and smile. But it's gorgeous. You go up Highway 69 past Parry Sound, past the French River and then go some more. Before Sudbury, you hang a left. Another 67 km of windy highway brings you to the prettiest bay with the most amazing boats. Bigass boats, like yachty things. Spent the day in the North Channel of Georgian Bay playing with PWCs. That's personal water craft. I say that like I knew what it was before yesterday. Last time I was on a jetski, they were still called that, and I was pregnant with Ari. That was not fun. Yesterday was fun. And these things are nothing like the old versions. We were based out of The Sportsman Inn, a glorious old place that has been totally done over and is now a real jewel in the marina. If you're thinking of a great place to go for a couple of nights, to escape kids or just take a cool road trip and stay somewhere and spoil yourself, check it out. Beautiful rooms, tiny, tiny town (population 500, though I'm told that is stretching it). Ask for owner, Rachelle. Lady rocks. So. Water and harbours and forests and stuff. 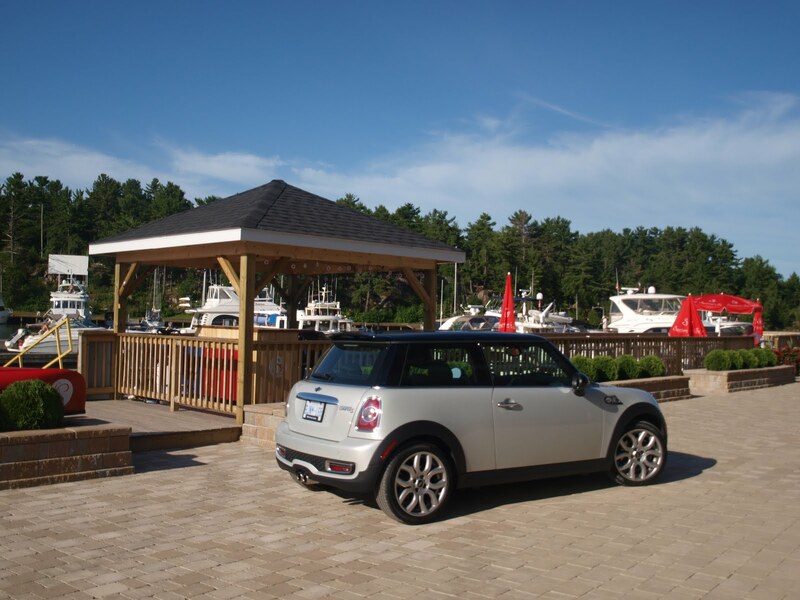 Why a pic of the MINI? That's what I drove up there. I love MINIs. Fun, fun, fun. For long stretches of winding isolated highways, this is the car. More later. I'd only been home a couple of hours before I headed north, after getting back from Quebec and the RV extravaganza. I had to dig through mounds of laundry to find the cats. And the boys. Wyy a pic of a MINI? Indeed... where is it? BTW, ever spoken with Alex Carroni at H-D? Lovely lady! While on the North Channel, there is a campground at Sprague, where you can rent a cabin close enough to the water to cast a line in. Though James is just as bad. Let's just say I was in agony for two days after getting back. Really agony - I'm sorry - Lucky we had the suspension machine -It was fun going fast with a Cool Blond on the back.Next time you will have to drive ( payback for me ) Love your articles on your boys.